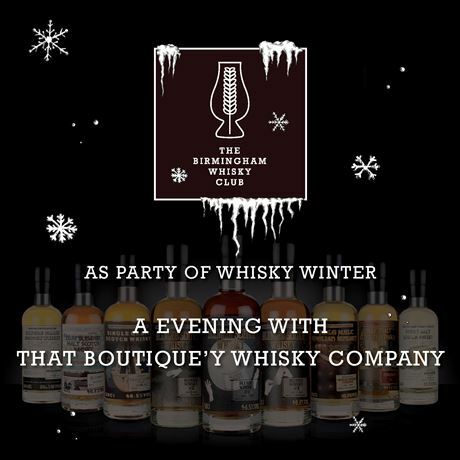 The Birmingham Whisky Club would like to invite you to to join them at The Wellington on Friday 20th October to meet That Boutique-y Whisky Company. Learn about their delicious drams, the history of the company and taste through a selection of their delicious whiskies. That Boutique-y Whisky Company bottles Scotch single malt whiskies from a variety of renowned distilleries in limited batches. These whiskies are adorned with cultish graphic novel-style labels which feature prominent figures from the whisky industry upon them, as well as other little details for you to find! Our line up for the evening is to be revealed (as it will be made up of new releases, hard to find bottlings and some really special drams), but you're guaranteed a stonker of an evening. These are single malts in the truest sense of the term; they are a blend of casks from one distillery. They are also bottled without age statements because each batch is dependent on the parcels of stock received so it is entirely possible that there could be an age difference of thirty years between batches! 7:00pm - Tasting begins. You will be led through a selection of different drams by the fabulous Dave Worthington and get a chance to ask all of your burning questions throughout. 10:00pm - Although the tasting is over, please feel free to stick around. Anything you were afraid to ask? Grab our resident experts and have all of your queries answered. No refunds or transfers. Events is strictly over 18's Only. *To order your Birmingham Whisky Club member ticket and claim a cracking £5 off, please enter your code on your membership letter in the "promotional code" box. If you need assistance, please email us and we will be happy to drop you a reminder. One discounted ticket per member.